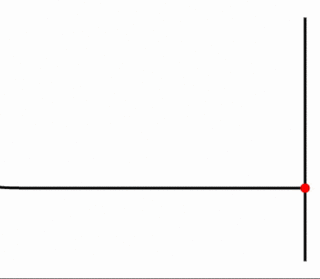 This applet describes a single atom gas moving in one dimension. 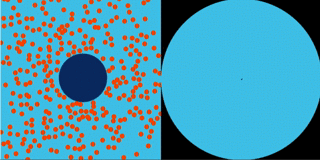 It accelerates or decelerates only through classical collisions with the moving piston on its container. This alone is enough to explain why the gas gets warm when it is compressed and cool when expanded. Newton's imaginary cannon is on a high mountain, and fires a cannonball above the atmosphere. 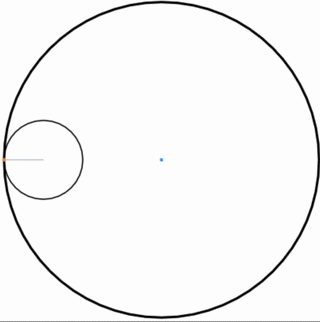 Depending on speed,it could fall, circle the earth, or fly away depending on how hard it was fired, showing the motion of an cannonball near the Earth and the circling motion of the Moon around the Earth are different aspects of the same thing. Rutherford scattering from a Thomson Atom and from a Nuclear Atom - Relevant Lecture in Physics 252 Modern Physics. Watch alpha particles scatter from Thomson's model atom with charge spread evenly through all the atom's volume (as most people believed), and another model with all the charge concentrated in a small central nucleus.These were the two competing theories of atomic positive charge distribution in 1910. The startling experimental discovery of occasional large angle scattering proved there had to be a nucleus. This was the birth of nuclear physics. 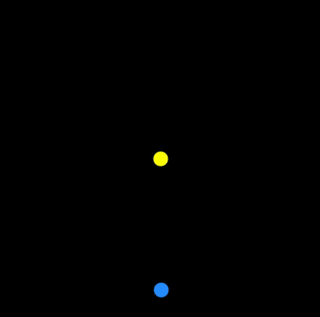 This applet shows how a chain reaction develops. 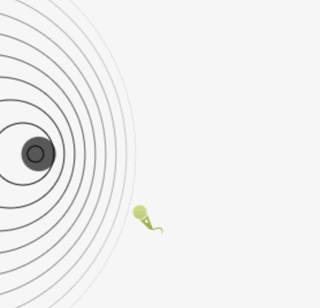 A nucleus in the middle emits a neutron in a random direction, if the neutron hits another nucleus it is absorbed, the hit nucleus emits two neutrons and dies. A full chain reaction, involving essentially all the nuclei, is much more likely to occur with a bigger piece of material. Try it! 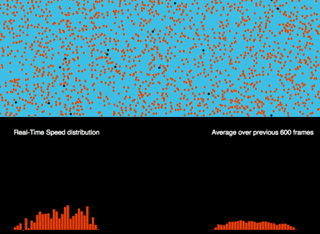 This applet shows how atomic velocities cause the Brownian Motion of a dust particle. In one panel a small ball jitters. In the next, we see that it jitters because many smaller balls bat it rapidly about. Here's the original Java version. The classic attempt to detect the Earth's motion through the ether: light waves were thought to be oscillations in the ether, analogous to sound waves through air -- so should have slightly different velocities in different directions, with, against, or across the ether flowing past the Earth. The apparatus is a race course between light going up and down stream, and light going accross and back, which should be a little quicker, a detectable difference. 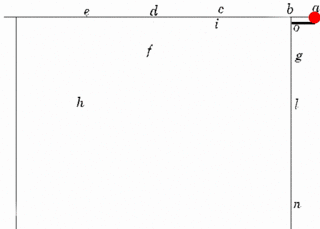 Here is Galileo's own diagram explaining that the parabolic path of a projectile, or a ball rolling off the edge of a table, can be regarded as compounded of horizontal motion at constant speed, plus vertical motion identical to that of a ball falling vertically. We've animated his drawing. 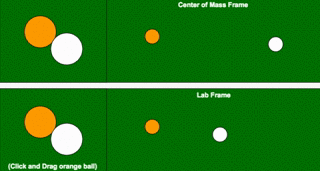 Shoot a cannon (or throw a ball!) to see how high and far the ball flies. 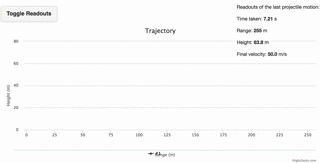 This is very accurate, and will plot multiple trajectories. 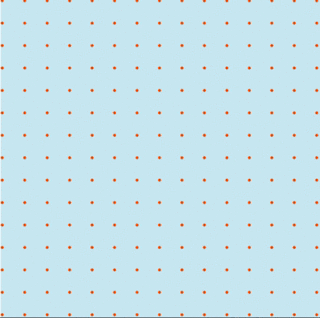 You can include realistic values for air resistance for cannonballs, ping pong balls, and anything in between. The waving motion of a string can be understood from Newton's laws if you think about a little bit of it, and the force on it at any instant as the imbalance of the tensions tugging at the two ends. 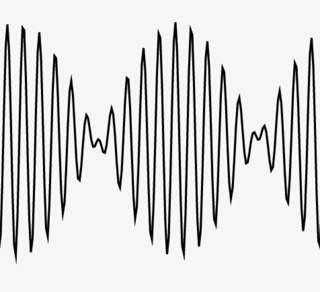 A sound wave is waves of compression and rarefaction generated by a vibrating object. As the wave travels through the air, it gives the impression of carrying some air along, but actually air stays where it is, vibrating about its rest position. 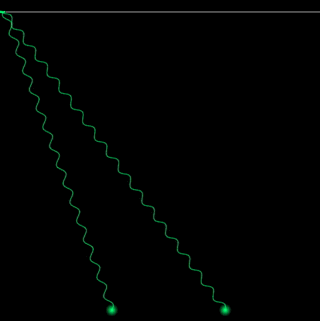 A wave pulse traveling down a uniform string under tension comes to the end of the string. A fixed end reflects it upside down, a free end reflects without inversion. This is explained by comparing with two identical approaching pulses on a string twice as long. A wave pulse traveling down a uniform string under tension comes to a join with a string of different density. The pulse is partially transmitted, partially reflected. 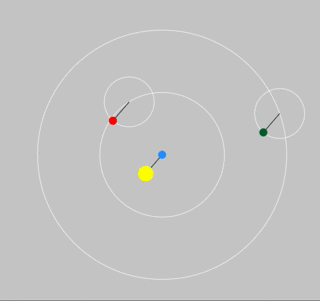 The relative densities of the two strings can be set by the slider. Note the phase of the reflected wave as a function of relative string densities. The physics is the same for a wide variety of wave reflection phenomena. 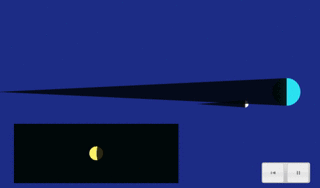 The moving object puts out wave pulses at regular intervals. 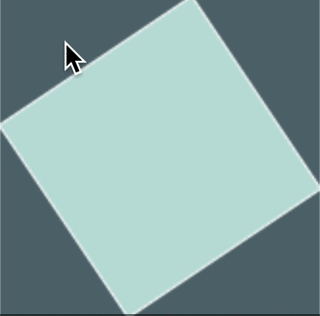 The cursor is a microphone! Hold it somewhere and listen as the source moves past you. Synchronized waves emanating from two slits form a pattern with destructive interference in certain directions, where the waves are out of phase. 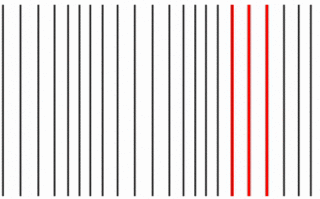 The slit separation and wavelength can be adjusted to explore how the pattern changes. We move across the screen point by point to see how the two waves successively augment and cancel one another. 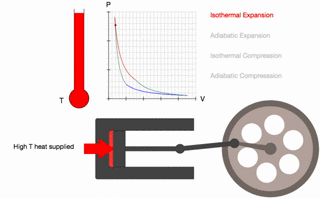 This animation relates the motion of the basic Carnot engine to the corresponding theoretical cycle in the P,V plane, and a thermometer. 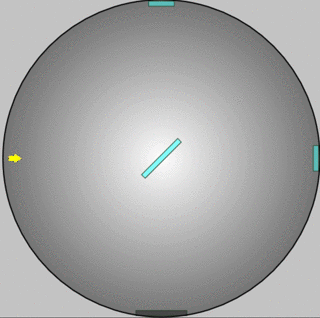 A box has red particles in the left hand half, green in the right. They all begin with the same speed but random direction. Watch as they mix! How long will it take? 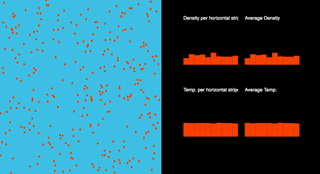 The vertical lines give the average positions of red and green particles. A dynamic realization: initially we give all molecules the same speed, collisions rapidly spread them out into Maxwell's predicted pattern. A dynamic realization: initially we give all molecules the same speed, but a steady gravitational force pushes them down the pipe. 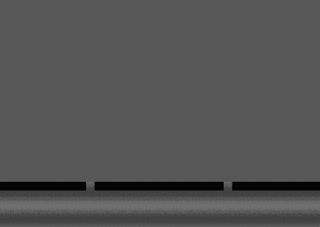 On encountering the walls, they lose their horizontal (along the pipe) velocity. Vertically, they bounce off. 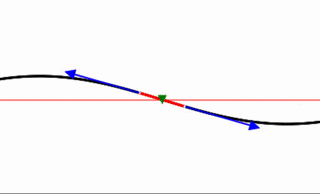 The velocity down the pipe approaches a parabolic profile. 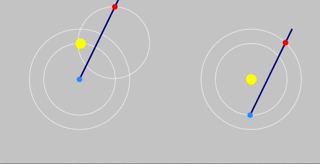 Natural motion for a free particle is straight line motion: for the particle to go around the sides of a square, it needs an appropriate impulsive kick to change its direction at each corner. Going from a square to a many-sided polygon, the kicks get more frequent, and in the limit of an infinite number of sides, it follows that uniform circular motion must result from a continuous inward force. Prove Pythagoras' theorem by moving the triangles around--in the original configuration, the total area inside the red square is equal to that of the four identical triangles plus the area of the central square on the hypotenuse (side = triangle's longest side). 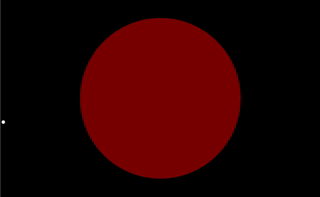 Rearrange to see that the total area inside the red square is also that of the four triangles plus the sum of the areas of squares on the other two sides. 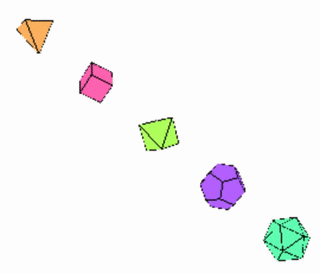 The only three-dimensional flat faced solids with every face identical, and every vertex identical. The path traced by a point on a wheel as the wheel rolls on a flat surface. 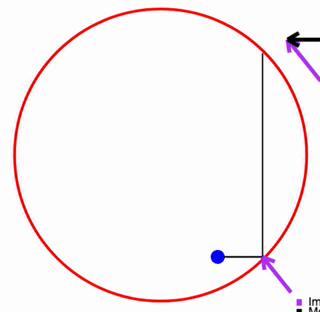 The path traced by a point on a wheel as the wheel rolls inside a circle. Change the group and phase velocities of interfering sine waves. Relevant Lecture for Physics 252 Modern Physics. A short movie of the Moon entering the Earth's shadow, and how it appears from Earth. The ancient Greeks used this picture to estimate the distance to the Moon. Their estimate was within ten per cent of the correct answer. A simple applet showing the relative orbital sizes and periods of the inner planets: Mercury, Venus, Earth and Mars. 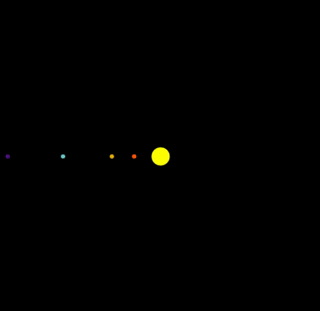 A simple applet showing the relative orbital sizes and periods of the outer planets: Jupiter, Saturn, Uranus and Neptune. 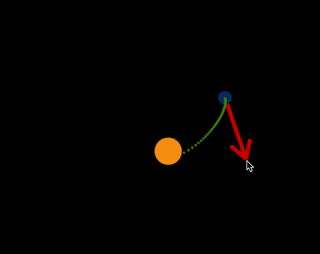 This applet is a slightly simplified representation of Ptolemy's model for the motion of the inner planets: this simple model can successfully account for the motion of the planets in the heavens to a very good approximation, but keeps the Earth itself at rest. 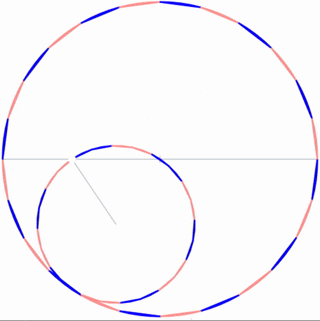 Ptolemy actually refined the model further with small epicycle corrections, necessary because the planetry orbits are not perfect circles, but (almost circular) ellipses. Point to notice: Venus and Mercury never get very far from the Sun in the sky. Think about how that works in the modern picture. 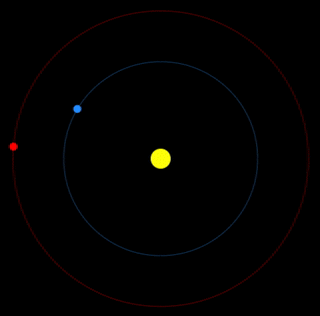 An applet demonstrating that the motion of Mars through the heavens agrees exactly with the Copernican (modern) view of the Solar System and the ancient Earth-centered epicyclic model of Ptolemy. It follows that observing the path of Mars through the stars, (or the path of any other planet, by similar model comparisons) cannot settle which model physically represents the real Solar System. 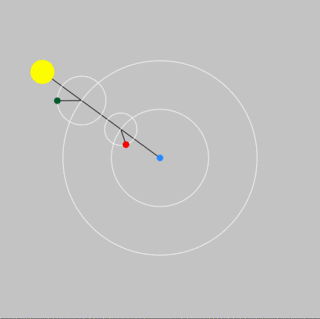 In the 1260's, al Tusi, an astronomer in Iran, created an ingenious model to represent an observed small linear oscillatory component of planetary motion in terms of combined circular motions, thus extending Ptolemy's model. Here is his model. Observing Mars: Ptolemy or Copernicus? 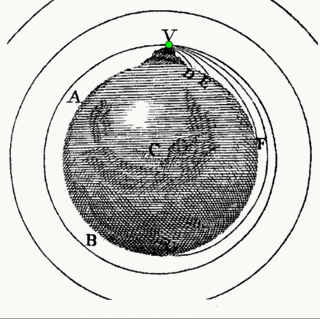 Kepler theorized that the planets moved on spherical surfaces separated by having Platonic solids just fit between neighboring orbits: see his model here. 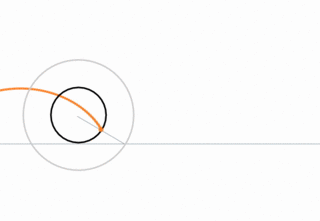 This applet plots the orbital motion of a spaceship launched from Earth at a given speed. Find the best orbit to Mars by launching at different speeds and at different times, to meet with Mars as it moves around its orbit. 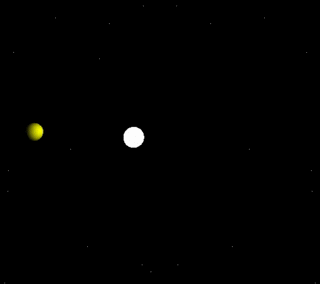 This applet shows Venus' orbit from different perspectives to understand how the sunlit half of the planet exhibits phasess like the Moon. 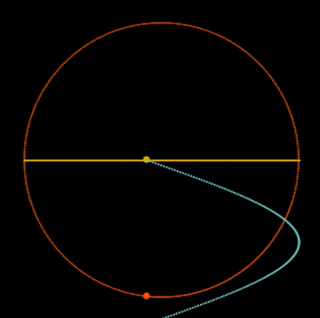 This applet plots planetary orbits with a force proportional to rn over a range of values of n. Find out when the orbits are unstable! 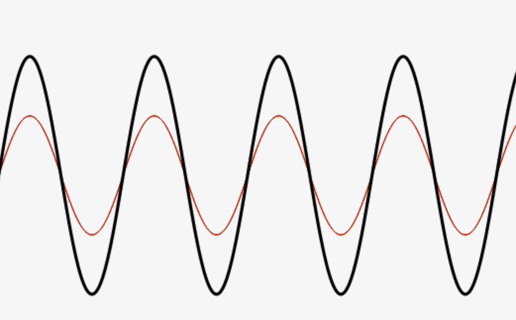 This applet adds two moving sine waves over a wide range of wavelengths and frequencies. Try to predict the results--some are surprising! How does a damped simple harmonic oscillator settle after being displaced, or being given an initial kick? 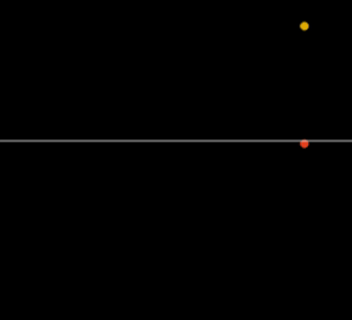 This applet traces its path as a function of time for these two different initial conditions. For low damping, it oscillates with decreasing amplitude. For high damping, it just settles down. 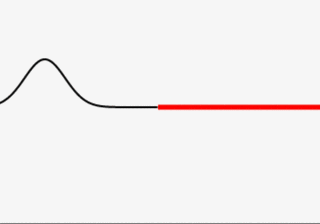 The dividing point is called critical damping. Find where it is. This turns out not to be the ideal damping for a car's shocks! How does a simple harmonic oscillator react to an external driving force at a different frequency?  This applet traces its path as a function of time, with sliders to adjust driving frequency and amplitude, damping, and initial conditions. Look for resonant behavior, and how it's affected by frequency tuning and damping.